When cold humid outdoor air is supplied and heated in a building - the relative humidity of the air is decreased. Outdoor air with dry bulb temperature 0 oC and relative humidity 90% is heated to an indoor temperature 20 oC. 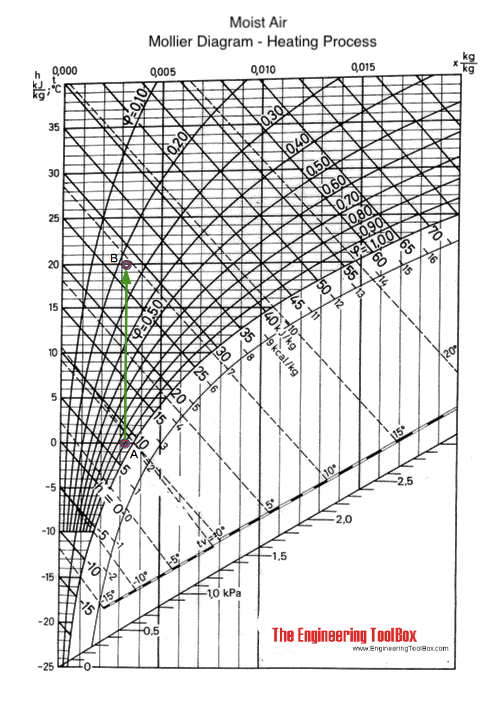 The process is visualized in the Mollier diagram above with the process from A to B along the constant specific humidity - x - line. From the diagram we can estimate the indoor relative humidity to approximately 23%. Note! - indoor supplies of vapor to the moist air - like latent heat from humans, animals or production processes - is not counted for. Latent heat supplied to the indoor air will move point B in the diagram to the right - to higher relative humidity. Sensible heat supplied to the room will move point B further up in the diagram. The table below illustrates the change in indoor relative humidity for a given outdoor temperature and relative humidities. Engineering ToolBox, (2008). Indoor Relative Humidity versus Outdoor Temperature and Relative Humidity. [online] Available at: https://www.engineeringtoolbox.com/temperature-relative-humidity-d_1118.html [Accessed Day Mo. Year].